Open & view OLM file data like emails, calendars, notes etc. Supports all versions of MS Windows OS, including Windows 10. With the help of OLM Reader tool, a user can easily open OLM file on Windows machine also without any hassle. It is one of the easiest ways to open, view and read OLM file of both Mac Outlook 2016 & 2011. Using this application, a user can view all data items stored in OLM file like contacts, calendars, tasks, emails with attachments etc. As a user add Mac Outlook OLM file in the OLM file Reader, it performs a quick scan on it. After that, it generates an instant preview of all folders containing emails such as Inbox, Deleted Items, Drafts, Sent Items,images, etc. Moreover, the application will display all properties also associated with each message such as email address, subject, received date, alerts, contact names, etc. In addition, a user can view data of damaged or corrupt, inaccessible, and orphan OLM file. The OLM File Reader tool is designed in such a manner that after scanning the OLM file it provides an instant preview of it. The tool permit users to open and view one OLM File at a time. However, if a user wants to view multiple OLM File at once, add multiple OLM files using "Add File" option. This will permit users to open and read multiple OLM files without any trouble. The best part of OLM File Opener software is that it maintains all details related to each item. In addition, it does not compromise the data integrity as it keeps all emails attachments, the read or unread status intact as original. It maintains recurrences along with alerts, meetings, etc., also from the calendar. Moreover, it shows all contacts related details also like email ids, mobile numbers, etc. 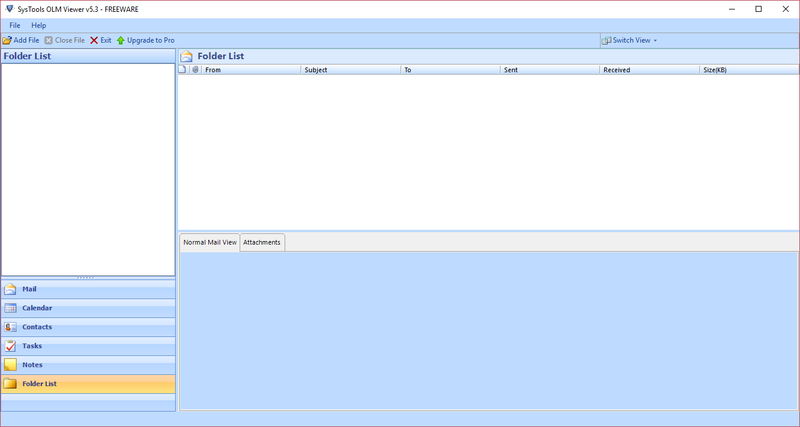 Step 4:Preview OLM Emails, Attachments, Conatcst, task & notes. 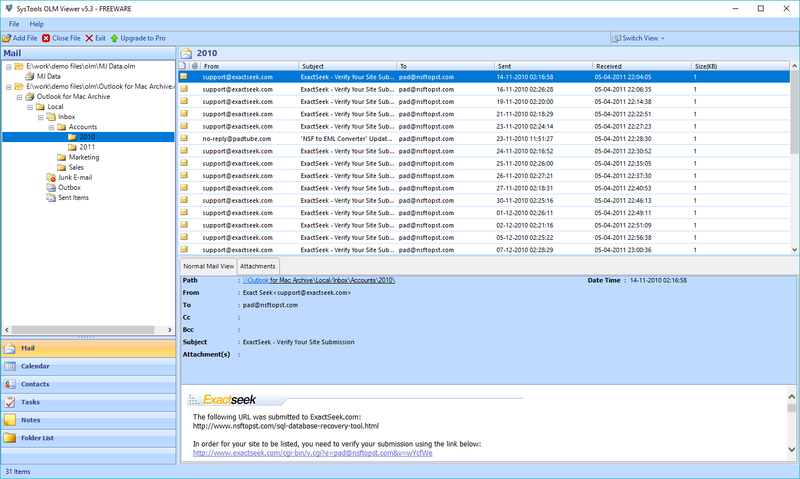 OLM File Freeware Software allows to preview olm emails with attachment, contacts, tasks & notes of Mac Outlook Version 2011 & 2016. Can I run this OLM File Viewer application on Mac OS platform also? No, a user is not allowed to use this application on Mac OS as it is a OLM File Viewer for Windows platform. Does the software impose any file size limitation in opening OLM file of Mac Outlook 2016? No, the OLM File Reader does not impose any file size limitation. It open and view OLM file of any size without any hassle using this tool. Is it possible to open OLM file of Mac Outlook 2011 on Windows machine? Yes, the software is capable enough to open and read OLM file of both Mac Outlook 2011 and Mac Outlook 2016. Does the software preserve folder structure of OLM file data? Yes, OLM File Reader software is designed with a high-tech algorithm, so it maintains the folder hierarchy OLM file. 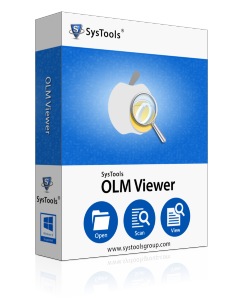 Mac Outlook OLM File Viewer is a fabulous application that I have tried till now. This is what I expect usually from good and reputed data recovery company. The application has a very simple user-interface and I did not find any difficulty in opening and viewing OLM file. According to me, great work was done by the development team. Hats Off!! The OLM file Reader is a plus point that allows users to open and read OLM file of Mac Outlook on Windows OS in a perfect way. Moreover, it provide preview of Metadata also associated with each item in OLM file. I like this utility very much and I am definitely going to suggest this tool to my friends and colleagues. Hope to see some more products like this by you in future.